During the SM Rosales stop of Chicosci for the ‘This is Not a Chicosci Record’ album mall tour, I got a chance to capture photos and record videos of the band up close. Not only that, I shook hands with each member (Carlos Calderon, Mark Estacio, Ariel Lumanlan, Miggy Chavez, and Mong Alcaraz) during the album signing after the show. Although I forgot to mention my name, I at least introduced myself as a blogger. Those few lines of conversation were monumental for a star struck fan as myself. Mong asked what my blog is. I said it was too long. Miggy then said I should just tweet it. I did, after the post had been published. @mggykills tweeted back. See image below. I was too ecstatic about it that I needed to write a post. It was similar to how I felt when Abe Olandres (Yugatech, #1 Philippine tech blog) tweeted due to a post I published which had mentioned his name and website. See post Beyond Luck: Be Inspired with PinoyExchange and Yugatech and Abe Olandres Sends a Tweet @marcyscreed. 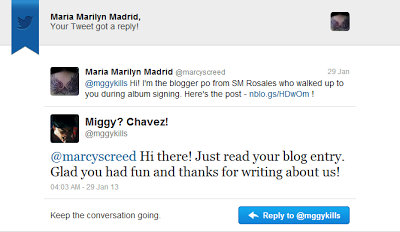 It’s always amazing to experience how celebrities and popular personalities communicate with lowly and regular fans. Thanks to social media, particularly Twitter. Thank you Miggy Chavez and Chicosci!